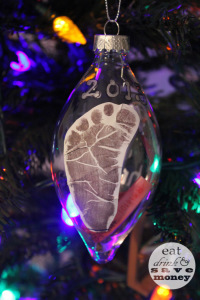 Ornaments are a big deal in our household because each one holds a very special memory. We don’t do fancy or themed trees like some people. Instead, our tree is a smorgasbord of ornaments that don’t match at all. 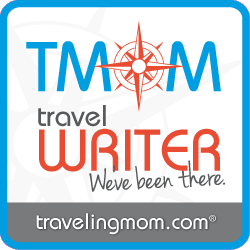 When we travel we always pick up a new ornament to add to our tree so we can reminisce about our travels. I can thank my mom for that tradition. 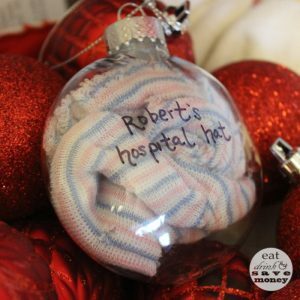 We are also pretty big on the personalized ornaments and make a big deal about each person putting up their “own” ornaments. I figured this year would be the perfect time to let Robert help make some of the ornaments for our tree. 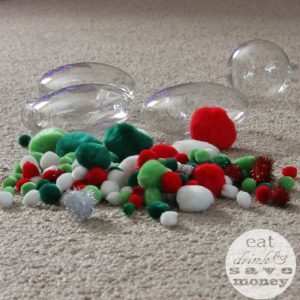 I love the plastic clear ornaments at Michaels and JoAnn’s and made sure to pick up plenty of them for crafts this year. They start off at 99 cents for the small ones and go up to $3.99 for the large. 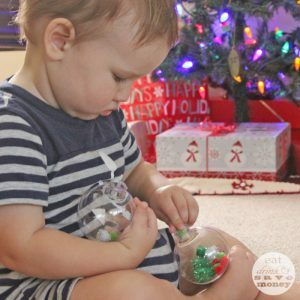 Since they are plastic they are perfect for Robert to play with and make his own ornaments. He’s a big fan of pom poms these days so I picked up a bag of Christmas colored pom poms, paint pens, and ornaments at Michaels and let him go at it. Lucky for me, I checked my Shopular app before heading to the store and found a 50% off coupon for any item. I was able to get a 6 pack of paint pens for $3. The individual pens usually go for $2 which makes me feel like I got a huge deal. 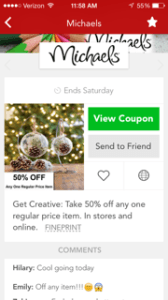 I always check my Shopular app before heading to the craft store to see whether Hobby Lobby, Michaels, or JoAnn’s has the best sales/ coupons that day. So far, the Shopular app hasn’t failed me! I think this app feeds my crafting addiction more than any other shopping addiction I have. Oh… maybe not. I check the Starbucks codes everyday too. 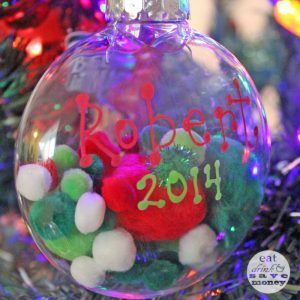 The best part about this Christmas ornament toddler sensory craft is that it took Robert 3 days to complete. 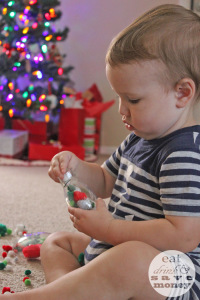 He really took his time and enjoyed putting each of the pom poms into the ornaments. I still can’t believe it entertained him for so long. Another good thing about this was that I felt like super mom for having him make ornaments for family members and teaching him how to sit still with a craft. Who doesn’t like to feel like super mom? It doesn’t happen very often so I try to hold onto the moments when I can. I’m thinking of opening up a baby craft sweat shop since this entertained him so well. Kidding. Or am I? I’ve seen similar crafts like this on Pinterest and I wish I could credit people who did this before me. I have no clue which website I would credit. 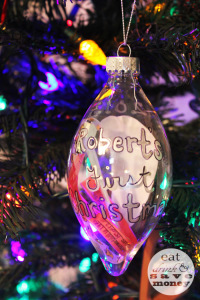 Instead, I’ll show you the ones we made last year to celebrate Robert’s first Christmas! This one has his hospital bracelets inside with his footprint sticker modge podged on the other side. The other one has his hospital hat in it. These would look so much better if we had bought new paint pens last year. I was too cheap and only had silver and black. If only I’d had the Shopular app with coupons last year! I may redo these soon and add some pretty ribbons. This is the 5th post in a series of 6 that features how I use the Shopular app in my everyday life. Even though this is part of a promotion, I’m absolutely still in love with the app and could probably feature how I use it every week even if I wasn’t officially promoting it. I seriously love it that much. What are your favorite ornaments and Christmas tree decorating traditions?